Posted: Fri Dec 01, 2017 11:55 am Post subject: Re: I SPOTTED YOU IN ARIZONA!! Saw this a few weeks ago at work in Chandler. Anyone here? Posted: Sat Dec 02, 2017 6:29 pm Post subject: Re: I SPOTTED YOU IN ARIZONA!! Posted: Sat Dec 02, 2017 8:29 pm Post subject: Re: I SPOTTED YOU IN ARIZONA!! That was ME! Going to visit Mom in the NH. Posted: Mon Dec 04, 2017 9:28 pm Post subject: Re: I SPOTTED YOU IN ARIZONA!! Saw Hank the tank this morning on Golflinks. Said howdy and a wave. Posted: Mon Dec 04, 2017 9:38 pm Post subject: Re: I SPOTTED YOU IN ARIZONA!! I saw Velociraptor at river and 1st on Friday. Said a few words while at the light! 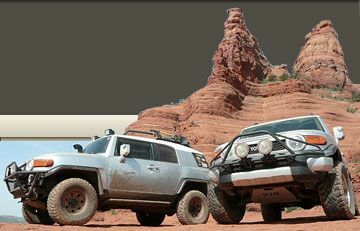 The Fj looks really awesome Ken! 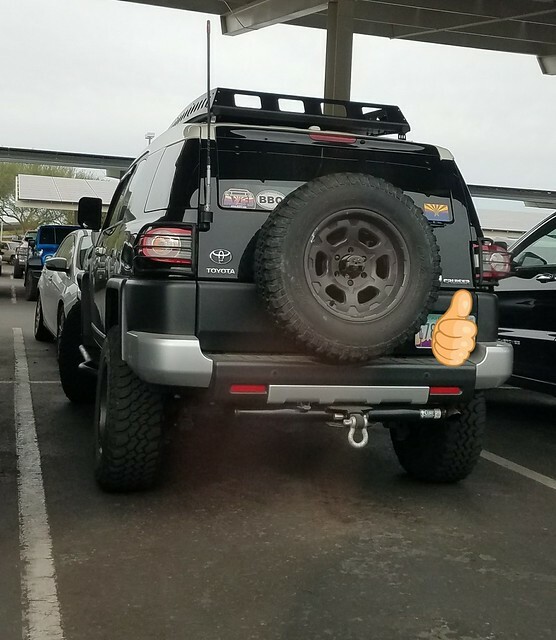 Posted: Tue Dec 05, 2017 4:48 pm Post subject: Re: I SPOTTED YOU IN ARIZONA!! Posted: Wed Dec 06, 2017 6:11 am Post subject: Re: I SPOTTED YOU IN ARIZONA!! I thought that was you, kinda dark in the tunnel! Posted: Thu Dec 07, 2017 7:49 pm Post subject: Re: I SPOTTED YOU IN ARIZONA!! 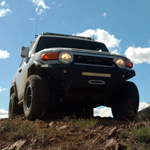 Traded waves with a modded silver FJ on Ocotillo Rd yesterday. Looked like they pulled in to Ocotillo Golf Course. Posted: Sat Dec 30, 2017 12:56 am Post subject: Re: I SPOTTED YOU IN ARIZONA!! Posted: Sun Jan 07, 2018 6:56 pm Post subject: Re: I SPOTTED YOU IN ARIZONA!! Spotted a voodoo blue heading north on Kolb on Friday - NISHOT? Had an AZFJ sticker. Tried a wave, but I was invisible in my new Rig though. On another Note, spotted Mr. and Mrs. LesZMor in front of Casa De Jimbolio today. Posted: Mon Jan 08, 2018 2:52 pm Post subject: Re: I SPOTTED YOU IN ARIZONA!! Mine has a Trails Offroad sticker, and my kids don't have laser swords (that I'm aware of), but everything else might fit. Posted: Sun Jan 14, 2018 10:50 pm Post subject: Re: I SPOTTED YOU IN ARIZONA!! Crossed paths with a Sandstorm FJ with an AZFJ sticker on the trails near the Butcher Jones Recreation Site this morning. Posted: Fri Jan 19, 2018 7:33 am Post subject: Re: I SPOTTED YOU IN ARIZONA!! Posted: Mon Jan 29, 2018 10:10 am Post subject: Re: I SPOTTED YOU IN ARIZONA!! She had an odd rubbing sound coming from the front end. My thought was that it's the backing plate on the spindle. We'll see what it ends up being. Posted: Sun Feb 04, 2018 10:51 am Post subject: Re: I SPOTTED YOU IN ARIZONA! !